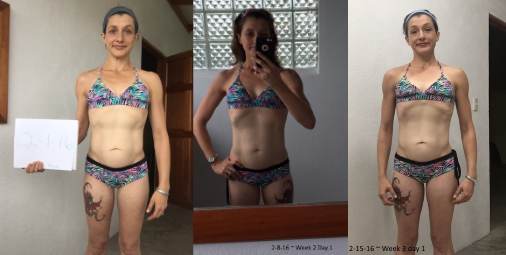 Two weeks down for the 12-week transformation competition on my coach, Jaco De Bruyn’s website. Yesterday was check-in day. My numbers were excellent considering I had two international flights with two kids by myself and a whirlwind three-day trip to the states over the course of the week. I was a bit worried because I tend to add weight when I’m up there. There’s just so many things, mostly food available that I can’t get in Costa Rica. But my willpower was strong! And I got the chance to workout in a real gym two out of the three days which is a real treat for me. My weight stayed the same, body fat went down, all movement with my measurements went in the right directions! It was a pretty good week last week! Starting this week, we are going to be tracking my Aesthetics Academy #fitbrother, Alex’s progress as well for the transformation competition! Here is a little about me, my name Alejandro from Chicago, Illinois. I am first generation US citizen; both my parents are from Mexico. I have always been into fitness, but running has always been in my blood. I used to run 11 miles every other day, and would go to the gym and lift a few weights, but I always went back to running. Eventually I began to make friends who were into lifting and developed a passion for it myself. Eating healthy came once I started to see my family having medical problems as a result of not eating right and being unhealthy. High cholesterol, high blood pressure, diabetes and more. Watching this has strengthened my resolve to change my path and hope I can change my family’s as well. One of my goals is to keep pushing my limits and make it on the stage one day. Next week, I’ll let you know how week three went for Alex and me!